Bissell came out with a new one! In this post, I will be reviewing the older model. And will compare the two using their site for reference. Let me begin by saying how much I love my Bissell! It really is a game changer. You can watch the review here on youtube, if you don’t want to watch it, please read on. What this machine does is it vacuums and washes your floor at the same time! If you are tired of being on your hands and knees scrubbing your floors, if you have kids, pets, a lot of foot traffic, just want clean floors….this is for YOU! It’s lightweight and easy to use and easy to clean. Buy it! I’m seriously in love with this machine. It has saved me so much time and time is something you can’t get back! It has helped my back, as in it got me up off the floor. I can now have clean floors without the stress on my back. Did I mention how much I love this?! Easy push button for different surfaces. This button releases clean water. Only a few parts. Makes things nice and easy! All parts easy to put on and take out of machine. Now if you have the “green” Crosswave; the original or if you have the new “purple” one; the Crosswave Pet Pro, you can’t go wrong. I haven’t used the Pet Pro yet and I no doubt will pick one up so I can show you the difference. In the meantime, from all that I’ve read, the difference that I can find are the bristles on the roller for the Pet Pro might be a smidge longer (could be because mine is worn) and on the Pet Pro there is a “pet hair” strainer. Both new features will fit on the older model and can be purchased through them! Way to go Bissell. Thank you for making something that can enhance the old model without having to purchase a whole new machine. So this “fur/debris” catcher fits inside the container that catches all the dirty water. It’s like a strainer so you can easily pull out the debris and toss it in the trash and the dirty water you can dump down sink or flush down the toilet. I wouldn’t normally buy this as I don’t find taking out the clumps of hair by hand an issue, however I will, so I can review it for you at a later date. The (maybe) longer bristles on the “new” roller is something I am very interested in, so I do see myself purchasing that even if I wasn’t reviewing it (I wouldn’t mind a new brush anyway). They also have two other rollers; one for wood floors and one for rugs. I’m going to definitely buy the multi surface roller and will probably succumb to the wood floor and rug roller attachments too, just so I can see how well they work. FYI, the multi surface roller that I have been using works perfectly for all the surfaces that I’ve used it on. Again, kudos to Bissell for making new attachments that fit the older model. I wish the Pet Pro was the same color as the original Crosswave. I’m not fond of that purple on a machine I use so constantly it is like a piece of furniture in my house! Hahaha. Other than the color, I am a fan! Insert cheering here* woohoo! You can check out more details on Bissell’s site here! So, should you buy this? For me it was a no brainer. I’ve been using this crosswave going on two years. I think in the video I said I use it 2-3 times a week. I probably use it 3-4 times on average. Some weeks I’ve used it daily. Basically this machine gets used! A lot! And still running like a champion. Gave me back time! From the moment my eyes open, I’m on my feet doing something. The Crosswave saved me time! Lots of time! Time you can’t get back! Two in one; vacuums and washes at the same time. Eliminate multiple “tools”. This replaces many. Easy to use. Maneuverability and size of this machine make it easy to move about my home. Easy to clean. Simple and easy to clean the machine when done using. Not a big cumbersome machine. Storing it in a small space is very doable. Makes cleaning fun! Not as fun as eating chocolate cake or hiking with my favorite peeps, though I save time using it so I can have fun eating said cake and go hiking! If you are teetering on if you should buy this, know that Bissell is donating up to $1,000,000 a year to BISSELL® Pet Foundation™3. That’s pretty awesome to me! How much can you clean before having to dump the tank? On the Bissell site, it says, “700 sq feet”. Just so you all know, dumping out the container isn’t a big deal. Seriously simple and easy and fast. Do you need to vacuum first? I vacuum sometimes before I use the Crosswave, but it isn’t necessary. I have a lot of furry four-legged family members. I vacuum anywhere from 2-4 times a day and I Crosswave a lot during the week. Thank you sooooo much for popping in here At-Kokos-Place! If you have this machine, I’d love to hear your thoughts and if you have any more questions, please mention them in the comment section and I will get back to you as soon as I can. Have a happy day and happy cleaning! If you know someone that this post would benefit, please share/follow. I so appreciate you and thank you in advance! Dyson heats, cools, air purifies your space! All three in one! How cool is that?! Look what Santa brought me! Dreams do come true. Santa knew! I don’t know how, I never said it out loud, nor did I write it in a letter to the big guy. Though I have a feeling a special elf was involved! I am super stoked to be talking about my new toy! I’ve walked by these units on display at stores for a couple of years. I must admit they had me at the “cool” setting during one very hot summer. The delightful coolness had me sighing and the near silent machine had me in awe! Then as winter would come they’d turn on the Dyson units that “heat”. The yummy warmth literally had me dreaming of one for myself. Something I didn’t know was Dyson made a unit that did both hot and cool and to make it even better they made it with an air purifier too! What!? Yes you heard me right. Seven is helping me unbox. What a good kitty! Since I took this out of the box, I’ve been using it daily. I know it’s too soon to review the longevity of it, but I will do a re-review on that later on during the year. I like its compact size and how quiet it is while on. I love the magnet feature on the remote. When done using it, you can set it on the top of the unit and it stays! No more losing the remote! The first thing my daughter said was it reminds her of “R2D2”. Of course we had to give ours a name! This is really easy to use. The controls are simple even for someone who isn’t techie savvy like me! I love that this is basically a 3 in 1; heat, cools, and air purifies. I love that this will replace three units in my home; space heater, fan, and air purifier and I’m looking forward to not having to carry the many units I do have up in the attic with each season when not needed. The only con I can tell this far is the filter is not washable or reusable. But…from reading the manual, the filter should last a year if using this unit for 12 hours a day! That really is pretty awesome. I’m sure the filter will depend on individual homes: dust, dander, outdoor pollen, etc. I didn’t go in to minute details on this, mainly because it really is simple to use. Plug in and go (well after I read the directions). All in all I’m excited about this unit. Stay tuned for another re-review on this in about 6 months time. Did I mention I had a few pets? Haha. They are enjoying the heating feature! Can you guess how many are dogs and how many are cats in this picture? Thank you so much for all your likes, comments, and follows. They really do make my day, each and every one! 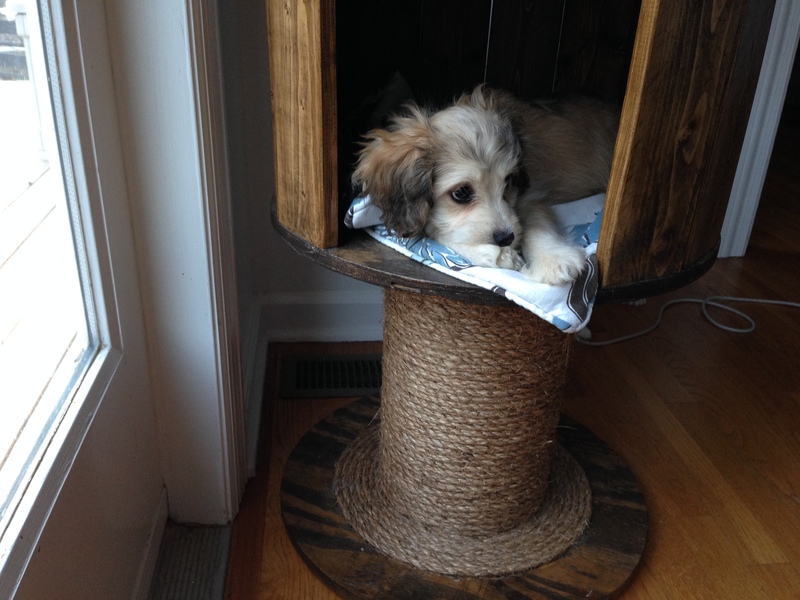 Cat tree…bed and scratching post. See they love it! 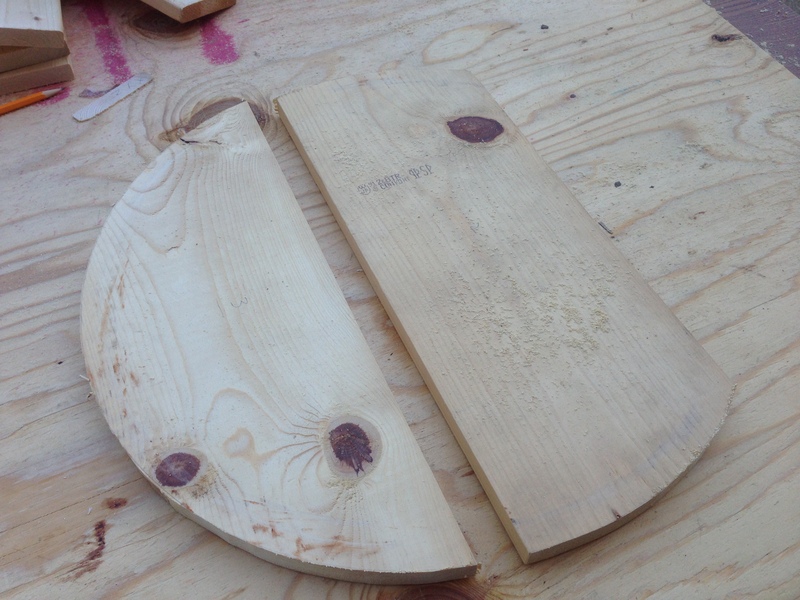 I clamped down each board and used my jigsaw to cut the shape. As you can see I used a lot of screws! 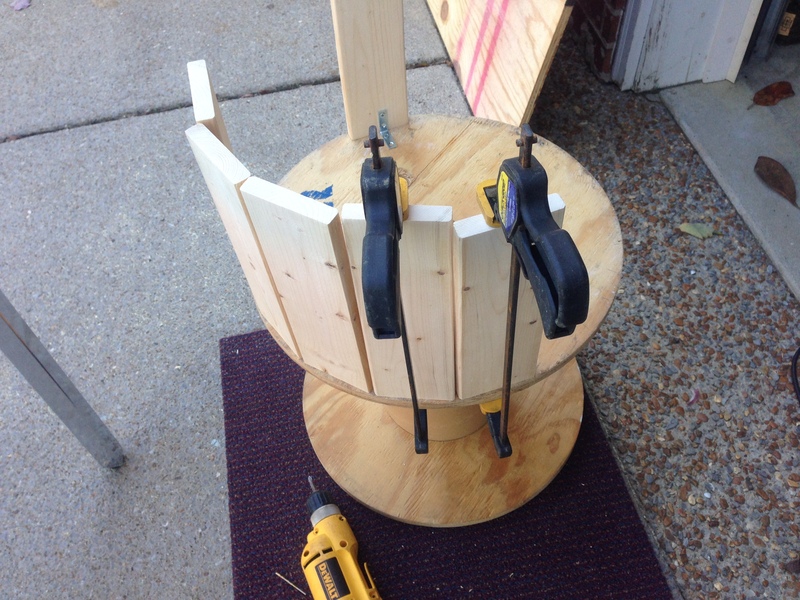 I set the lid aside and started to assemble the sides. Again going to my scrap lumber pile I was able to find 1×4’s. 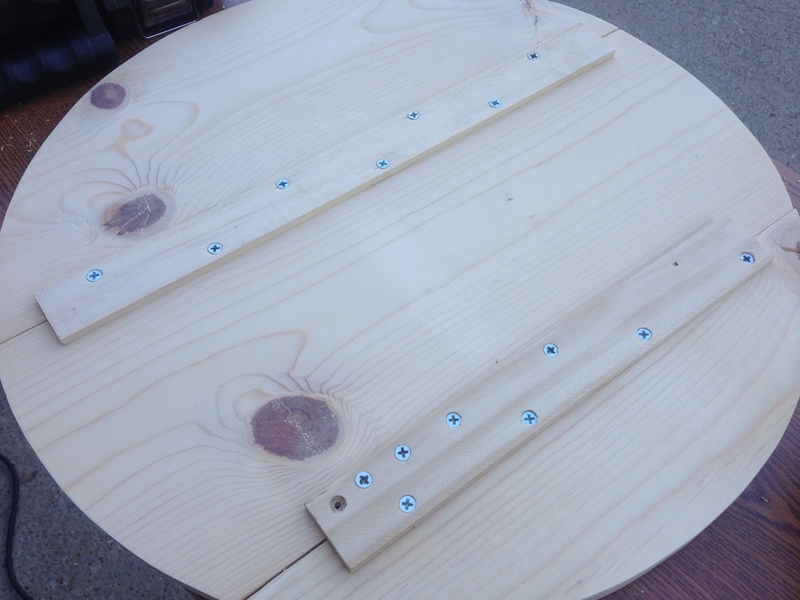 Sanding all the pieces…I had to sand quite a bit, to rid them of the dents and discolorations. 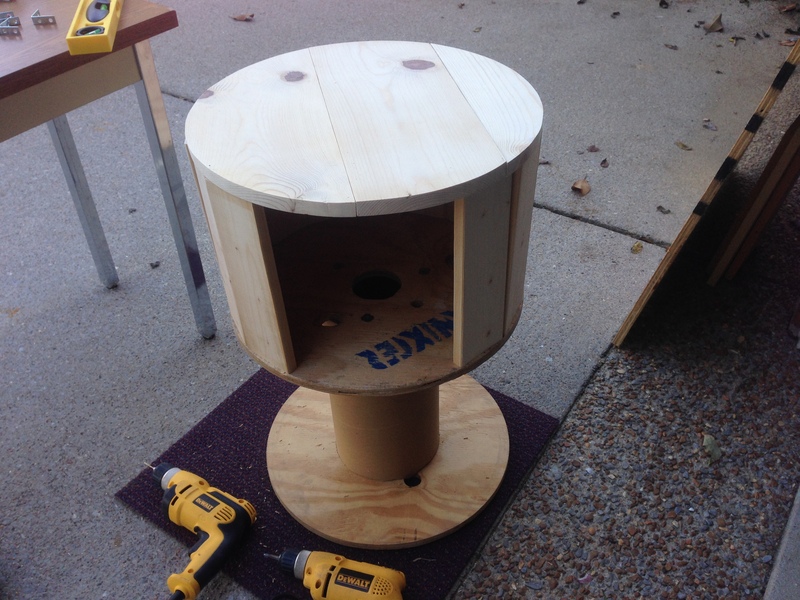 After sanding the boards I used a chop saw to cut the boards the height I wanted the “cat house” to be. 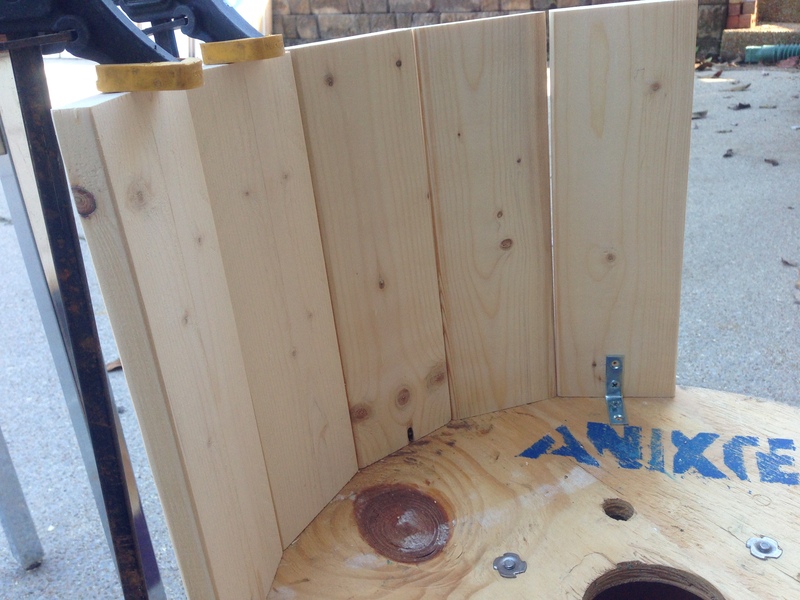 I contemplated using “L” brackets to hold the boards in place while I screwed each 1×4 to the top of the spool, however I ended up just screwing them straight to the spool using two screws per board. You can see from this pic that the boards are wonkie. Don’t let that discourage you! It will all work out in the end! Promise. 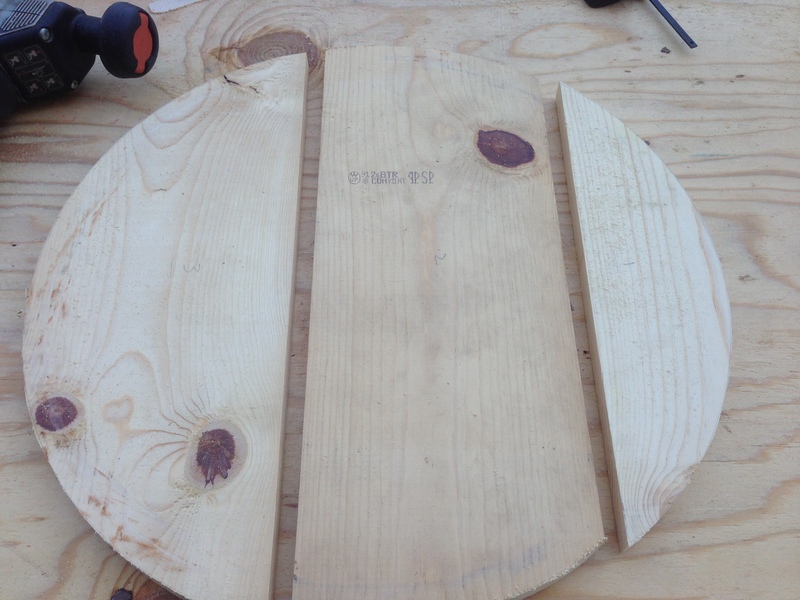 After all the boards are screwed from the bottom, I put the lid on and began to move boards into place so I could screw down from the top of the “lid”. I knew the screws would be showing. So I spaced them apart to be appealing to the eye! And see all the wonkie boards are in place as promised! 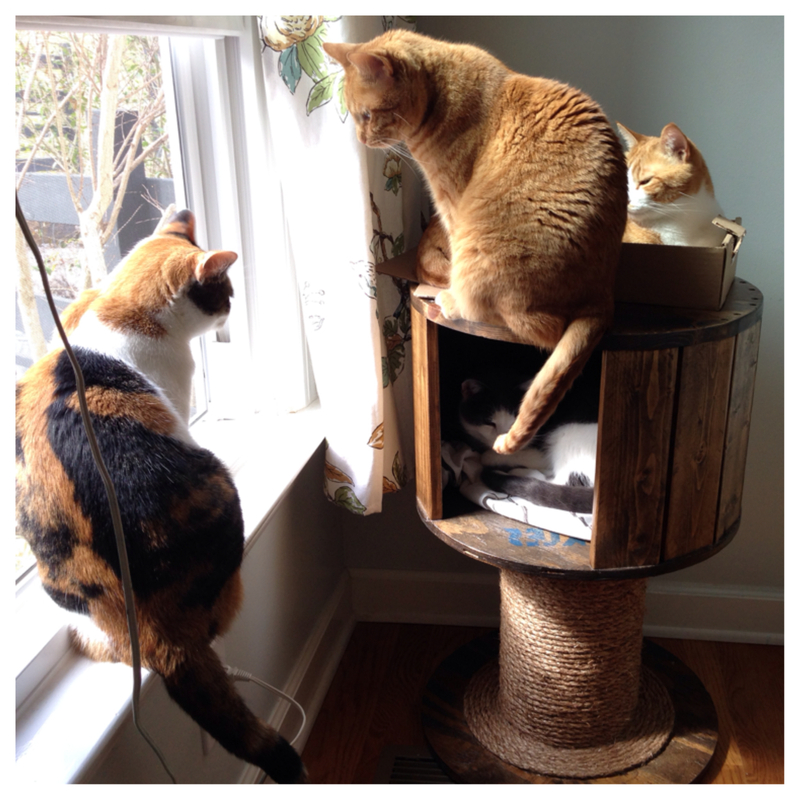 To the base of the tree…I used sisal to give the kitties an awesome scratching feature! 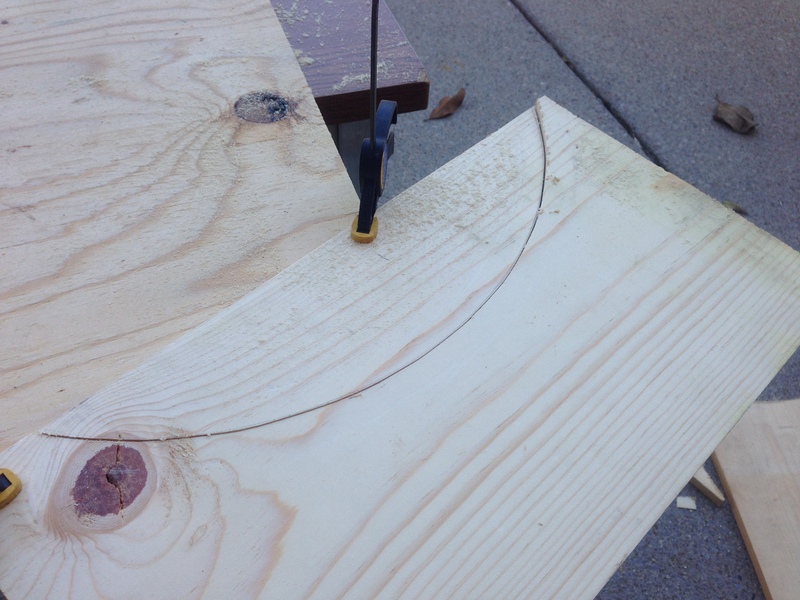 I achieved this by using hot glue and good rope. You don’t have to glue the entire base. 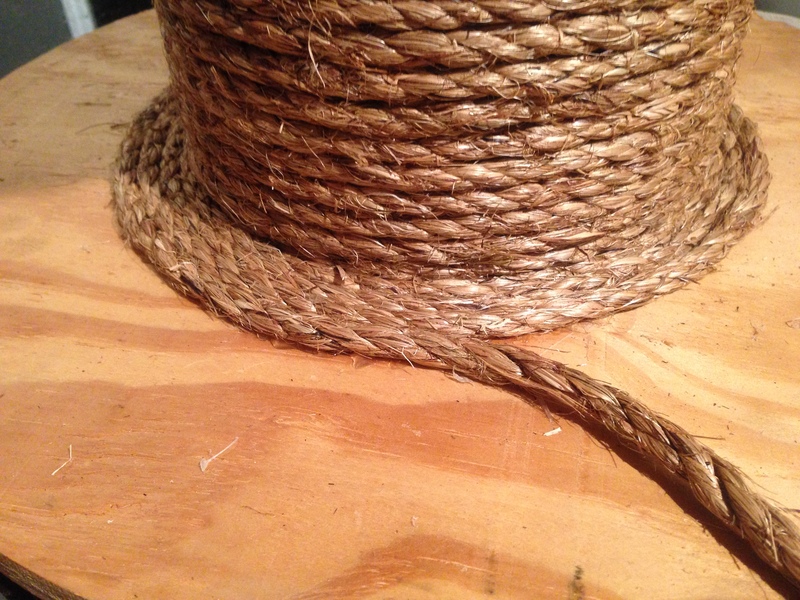 You can glue a few inches, wrap the rope, glue a few more inches, wrap rope…and so on…Keep going until you’ve reached the desired look! 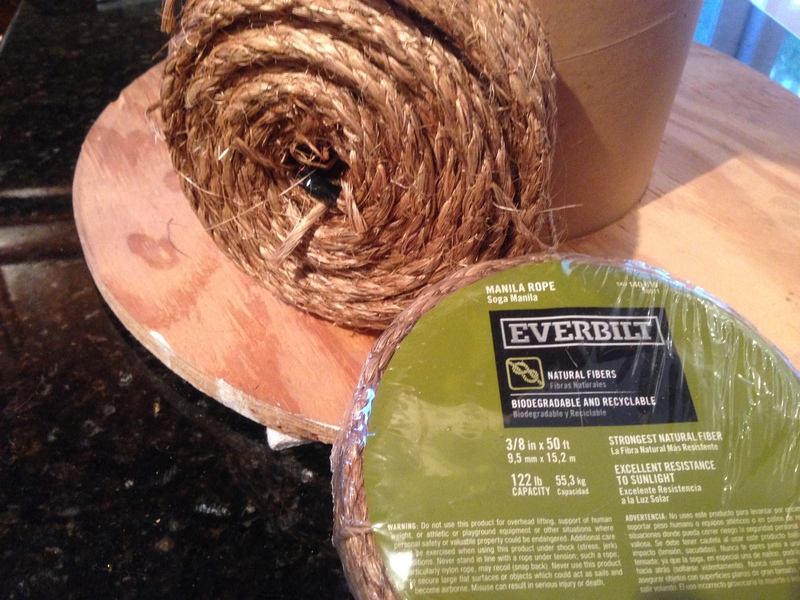 This is the rope I used. It’s sisal; a natural fiber. There was no odor on the rope. 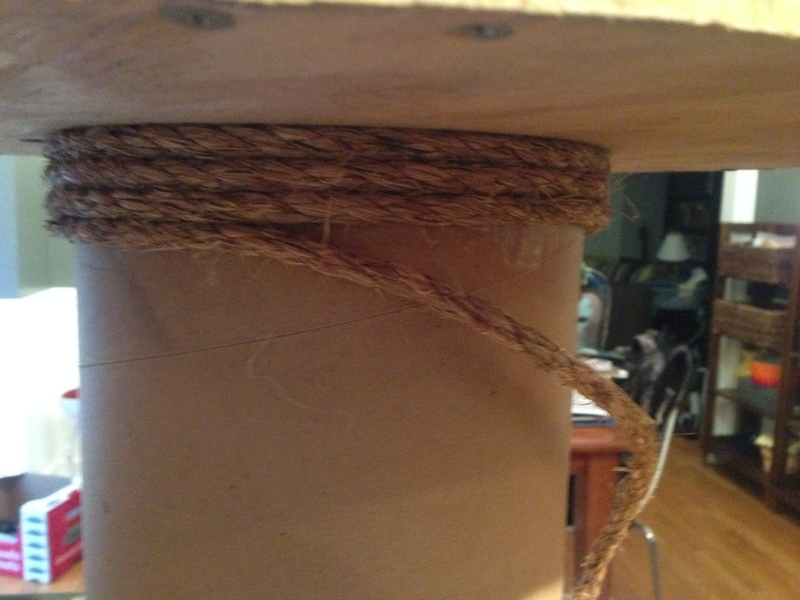 I’ve bought sisal before via online and gosh was that a mistake! The smell was so awful that no amount of soaking it in any type of solution would get the stench out! I make a point now to only purchase rope if I can touch it/smell it. This was from HomeDepot. I started right under the sleeping quarter. I stained the whole thing with dark walnut left over from a flooring job I did. I put three coats of water based poly after. As you saw I stained the piece before I added the sisal. If I were to make another I would probably stain and seal beforehand. Though in the end, I was careful not to get any on the rope. This was an easy project that really didn’t take long at all. Maybe a couple of hours? The longest part was waiting for the stain to dry and the smell to dissipate. 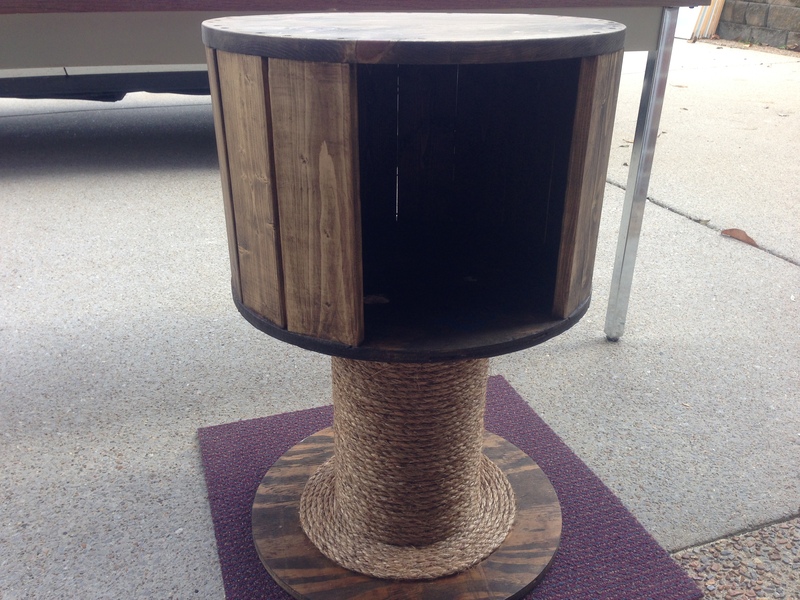 The kitties really like it and this piece doubles as an end table! Remember the lamp shade I made? Here I staged the lamp on that. But since then, I’ve moved it about the room where ever an end table is needed! This was a fun project and I was happy to create something for my furry friends. They really do like it and love scratching their claws on the sisal. 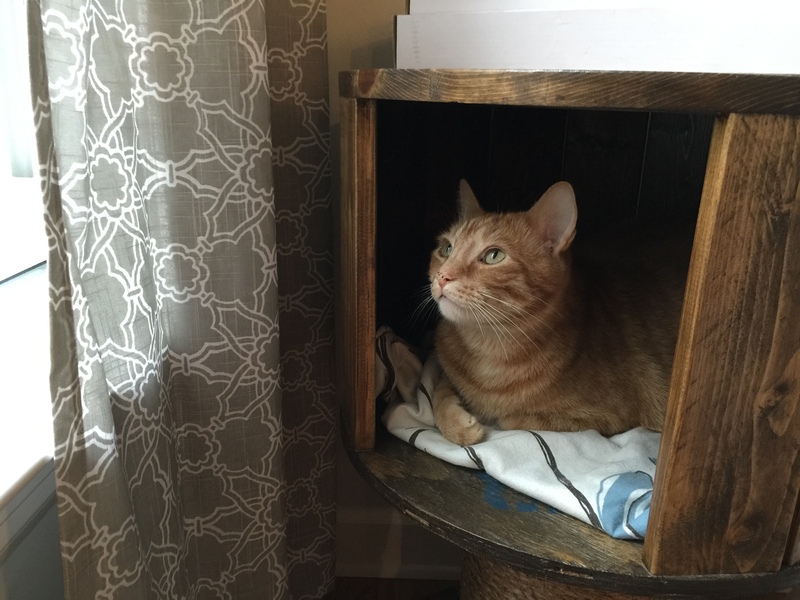 I hope you enjoyed this post and it inspires you to make something for your pets too! 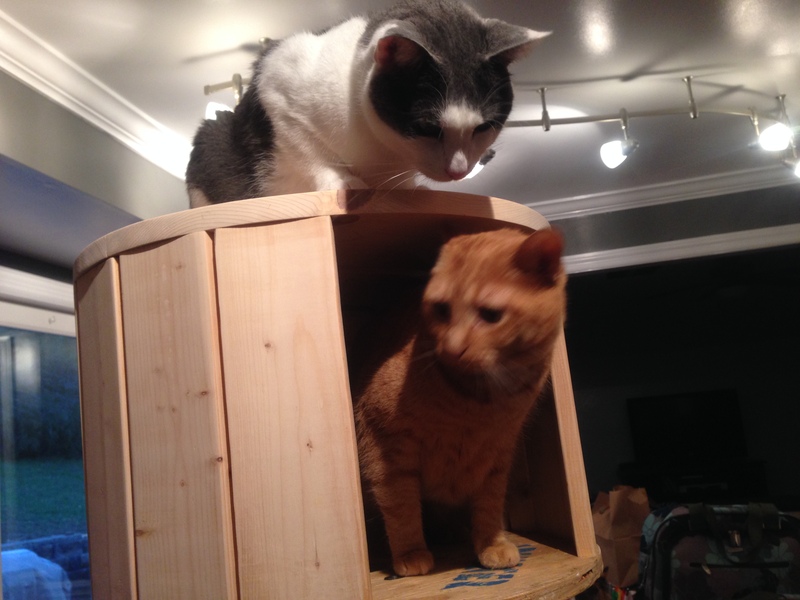 And as you can see…not just for cats! 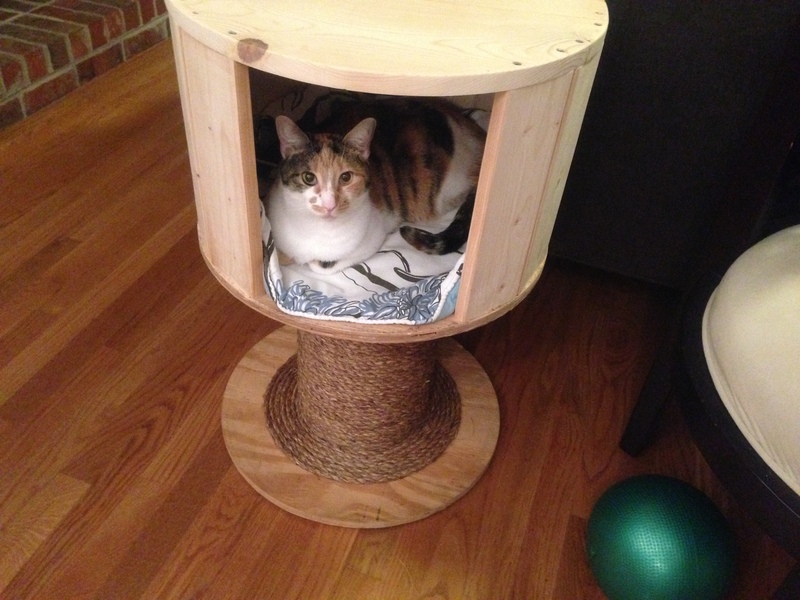 Thinking outside the box can be really fun when creating pet beds. This one is made out of a bass drum. (My son’s very first drum set when he was five!) He didn’t want to get rid of it so he donated it to my many causes…Stay tuned for what I’ve done to the rest of his drum kit! So what I did here was simply take off one of the heads and added a pillow. Her blanket was in the washer at the time, but you get the idea. Lay something soft down and your pup will know what to do! Not only do I find all my dogs loving this bed (except for the great dane and that’s because only her head would fit), but the kitties love sleeping in it too! 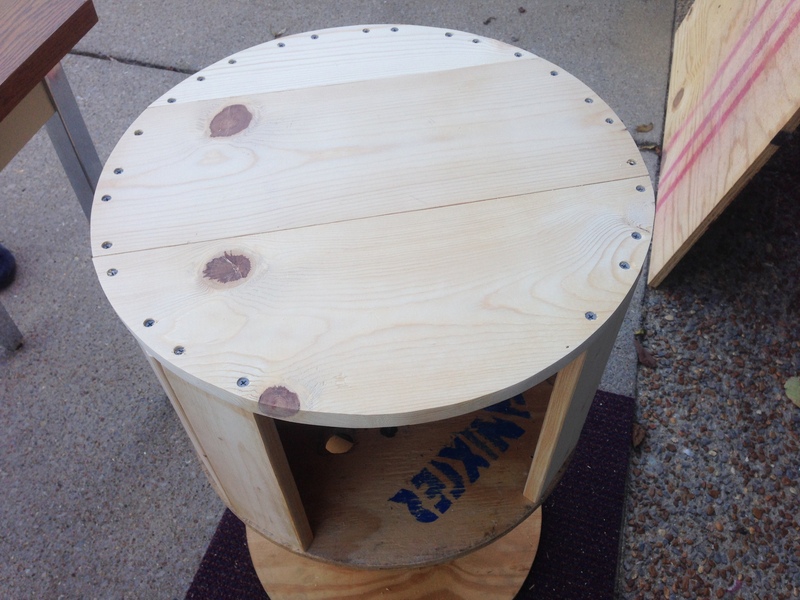 This drum was lovingly refinished, sanded and stained by my son, to allow the natural wood to shine through. You did a fabulous job son! It’s a conversation starter and looks very stylish anywhere in the home. Get creative…re-think…re-purpose! I guess she wanted no part of loving. LOL…It’s incredible to me how much I’ve come to adore this furry little monster. She’s comical at times, cheeky at best, and loving when only when it’s me and her. If one of her adopted siblings are around, she doesn’t dare snuggle. She’s off in some hidden place as if to say, “I want mom to myself”. Today is Monday. Labor Day here in the United States. Everyone is supposed to take the day off. It also signals the end of BBQ season. In fashion it’s the end of wearing light summer suits for men and the white pants for women. It’s an interesting custom, one which I don’t practice. I for one BBQ year round and if I want to wear white in the winter, so be it. Is Your Cat In Pain? Signs To Look For. Cats are master disguisers of pain. How are we to know when they are in pain? What are the signs? How about the new kitty you’ve adopted or the one you are fostering? How can you tell if she is in pain? Here are some tips in how you can tell if your feline needs more than love, food, and comfort. What is the difference between being scared or outright pain? Is your kitty suddenly running off to dark small spaces? Is she wailing/crying for no apparent reason? When you touch her does she shy away/bite at you/claw at you? Does she seem abnormally tired/sleepy/not as active? Any signs of discharge from eyes/ears/bottom? Look at how she walks. Is her back hunched? Does she hang her head low? Is her breathing odd, too slow/too fast? Is she pacing the room as if she can’t get comfortable; laying down only to get right back up? Clean Without Toxins And Clean On The Cheap! To clean my home can be a challenge seeing how not only are there humans running around (and a revolving door for friends); there are eleven furry beings, one reptilian, and oh I can’t forget the itty bitty dwarf hamster my son got me for a birthday gift almost 4 years ago. I clean, clean, and when I think I am done, I clean some more. There are many products we buy at the market that can be very poisonous to our pets and if they are poisonous to our pets just think how toxic they are to us. I’ve been making my own cleaners for better part of two decades as my daughter came into this world sensitive to most everything. Before my little bouncing joy was here I can remember as a girl getting out the mop bucket and vinegar. What vinegar didn’t clean away there was baking soda. Over the years I learned and added some other things to my arsenal cleaning; peroxide and essential oils, oh and can’t forget the power of lemon (yep the whole fruit and nothing but the fruit, skin and all! I will be posting recipes and what I do to clean my home in a part one, two, three…well you get it? I don’t want to bore you completely by giving it to you all at once! Okay this is what I do for my sinks and tub (anything with a drain that can get gunk build up over time). Hint: If you want a “smell good” smell; drop a drop or two of lemon, orange, or lavender essential oil down during last pot of water. These essential oils disinfect too; killing those nasty germs! Baking soda is awesome! It scrubs nice and easy without scratching. It removes most stains (I have yet to meet a stain in my house I couldn’t get out) and gunk. It is amazing polisher for shiny things like my faucets. What I love…it deodorizes! Does all that and is inexpensive too! White vinegar is my workhorse. Gets through a lot of scum. It disinfects and is a deodorizer as well. Oh and that stuff is inexpensive as well. Love that!